toast | Gluttoner: You gonna eat that? 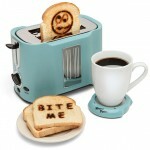 This toaster has the right attitude. The Pop Art Toaster has a retro 1950’s design and imprints either “Bite Me” or “ugh” into each piece of toast. Burn!